Mumbai: The attack on Union agriculture minister Sharad Pawar in Delhi on Thursday sparked protests in his home state Maharashtra and invited strong condemnation from political parties. Senior NCP minister Laxman Dhoble led the rasta roko at Mohol in Solapur district. The protesters shouted slogans, condemning the attack. NCP workers blocked vehicular traffic at Trimbak Road and Kalwan in Nashik district to condemn the attack on their party chief. In adjoining Navi Mumbai, the agro produce market was closed in protest. In Baramati, Pawar’s native place in Pune district, traders observed spontaneous bandh. Political parties were quick to denounce the assault. Maharashtra BJP president Sudhir Mungantiwar condemned the attack, describing it as cowardly. Leader of opposition in Maharashtra Assembly Eknath Khadse said, “In a democracy, such attacks are condemnable. One can protest using non-violent means but such an attack cannot be justified." Home minister and NCP leader R R Patil said Pawar’s security needs to be stepped up in the aftermath of the incident. 71-year-old Pawar, who went to attend a literary function at a public auditorium on Parliament Street, was slapped by Harvinder Singh, a transporter in his thirties who had also assaulted former telecom minister Sukhram outside Rohini Court on Saturday after he was sentenced in a corruption case. The NCP workers also held protests at Mulund and Worli areas of Mumbai. Some party workers were taken into custody in suburban Mulund for trying to disturb law and order, said a police official. Tight security is being maintained across Mumbai following the incident, said police. 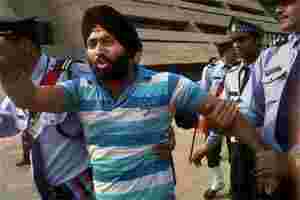 Prime Minister Manmohan Singh on Thursday strongly condemned the assault on agriculture minister Sharad Pawar. “The Prime Minister regrets the increasing tendency to take recourse to violent means to express disagreement," said a statement issued by media adviser to the Prime Minister. Singh spoke to Pawar who was slapped by a youth at a public function, claiming that he was angry with corruption and price rise.